Lula Lounge, Toronto’s home to world, jazz, Latin and Brazilian music is about to celebrate its 15th birthday. Making a go of it as independent, grassroots music space can be extremely precarious, as is evidenced by the numerous recent Toronto music venue closures. When you factor in the added challenge of presenting genres that generally lay outside the musical mainstream, the perseverance of a world and Latin venue to the 15 year mark, might be considered even more remarkable. And while there were many times that the Lula team feared that the doors might have to be closed, the venue and programming/educational organization now seems to be on solid footing and ready to expand it’s vision for the coming decade. With plans to increase accessibility and capacity over the next two years, Lula is striving to also striving to expand the breadth and impact of its programming. From June 1 to 11th Lula Music and Arts Centre/Lula Lounge throw themselves, and the musicians, dancers, audiences and partners who make the venue possible, a 15th birthday party with the Lulaworld Festival. Lulaworld 2017 will bring together artists with roots in Cuba, Chile, Tibet, Colombia, Mexico, Brazil, Portugal and beyond for eleven days of original collaborations and newest projects that cross borders, genres and generations. 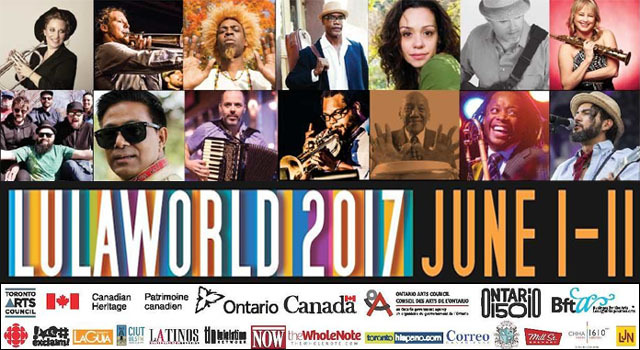 This year’s edition of Lulaworld features more than 20 performance including two CD releases, a street mural project, lessons in Brazilian forró, Cuban salsa, and Tibetan dance, a panel on music in the media and a community street brass band performance that you can take part in. All concerts at Lula Lounge, 1585 Dundas Street West, Toronto except the daytime concerts on June 3 which will be at the outdoor stage at Dundas West Fest at 1630 Dundas West.